Among the earliest homes on this Volker block (36th to 37th, Genessee to Wyoming) was that of pioneer butcher Isaac Levy. 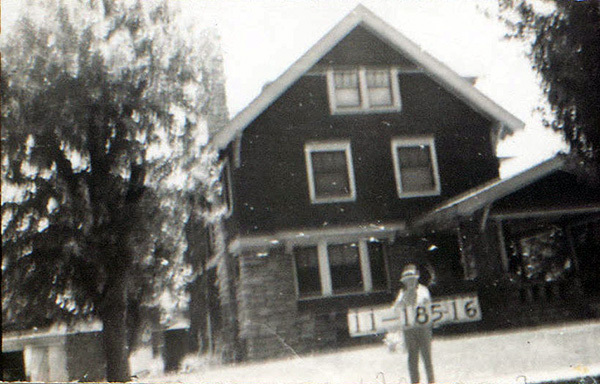 He and his family lived at 3615 Genessee in 1910, when there were only six homes on the block. In the 1920s, developers began building the apartments that now line the Wyoming Street side of the block. Isaac Levy and his family were among the earliest residents of this Volker block from 36th to 37th between Genessee and Wyoming. Levy was a pioneer Kansas City butcher and appears to be the first home owner on the block. This Tuttle & Pike map from 1907 shows the Levy home in blue, just above a street called “Levy’s Court” which has long since disappeared. The block also contained five rental homes, seen in pink. 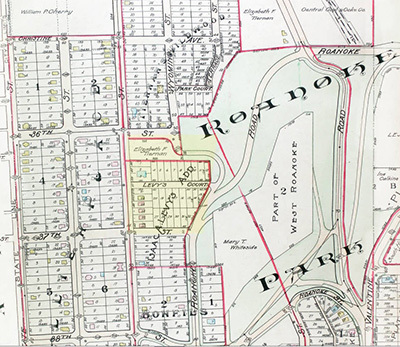 The very north end of the block is labeled as belonging to Elizabeth Tiernan, who was the widow of Peter H. Tiernan, a politician known as “honest Peter Tiernan.” They lived at 35th and Genessee. A Tuttle and Pike map of the block in 1907. As part of our Uncovering History Project, the Midtown KC Post is taking a look at each block in Midtown, including a set of 1940 tax assessment photos which is available for many blocks. (Many people seem confused by the tax assessment photos, which all include a man holding a sign. Here’s the story behind them). Today, the block from W. 36th to W. 37thbetween Genessee and Wyoming. Old timers in Kansas City told a story about Isaac Levy, a French-born Kansas City pioneer. In 1859, new to Kansas City, he was on his way to a real estate office to buy the Boly Building at 12th and Walnut for $1,500 to build a meat market there. But, the legend goes, he ran into a friendly patrolman on the way, and the policeman told him the lot would never be worth anything. Levy reconsidered, and several days later he bought a 25-foot frontage at 1324 Main for $2,500. That property already had a suitable store and room for the family to live above it. The Levy butcher shop prospered. Many families visited the store where Levy recorded their purchases in little yellow books. Over the years, land values went up, but Levy said he would not sell until he could get $25,000 for his $2,500 investment. That happened in the 1880s. 3615 Genessee: Issac Levy, 65, retired; Morris Finklestein, 29, son-in-law, salesman; Tille Finklestein, daughter, 24; son Leon, 34, butcher; son Forrest, 26, butcher; son Harry, 19, butcher; servant Annette Larson, 22, who immigrated from Sweden in 1906. 3629 Genessee: Herbert Waters, 34, a minister of the Roanoke Presbyterian Church; wife Evelyn, 34; son Warren, 3; son Herbert, 1; brother Ward Waters, 25, private theater actor; widowed aunt Emma Whitticer, 80. 3633 Genessee: Frank Dekofssky, 34, a scales manufacturing salesman who immigrated from Russia in 1888; wife Rose, 29, also born in Russia; daughter Ellen, 10; son John, 8; daughter Sophia, 6; daughter Ruth, 3. 3637 Gennessee: Michael Eiser, 33, engraver; wife Ida, 33 (both of German parents); son Howard, 7; son Ralph, 5; brother-in-law John Assel, 36; sister-in-law Louise Assel, 38. 3641 Genessee: Herman Steinfels, 55, a cattle company stockman; wife Barbara, 49 (both of German parents); son Alfred, 24, stockman in a cattle company; daughter Della, 19; mother-in-law Sarah Steiner, 75, a widow born in Germany. 3645 Genessee: George Sawyer, 44, a barber; wife Anna, 40, of Swedish parents; son Alverne, 13; son-in-law Jas, 24, a painter for the street railway company; daughter Anna Davis, 19; grandson Robert Davis, 0. The photos below show the buildings on the block as they looked in 1940.